With my hometown team, the San Francisco Giants, winning a world series in seven games this year, I got to thinking about other game sevens. These days, you can do more than think about them; you can watch them, or at least parts of some of them. The match often cited as the best game seven of all, the Pirates vs. the Yankees in 1960, is now online, or at least the last three innings of it. It’s been 54 years since that game, which the Pirates won 10-9, the home team winning when Bill Mazeroski hit a home run to open the bottom of the ninth. The game of baseball itself has changed a lot since then, and so has television. What surprised me the most on viewing these three innings, however, was how little baseball has changed in some respects. I’m not a fan of the other major sports, but I imagine if you saw a football or basketball game from 1960, it would look quite a bit different than it does today. There’s been a lot of talk, mostly justified, lately about speeding up the pace of major league baseball, with many games dragging over three hours or more (four hours or more, sometimes, in the postseason). Watching games on TV is itself a much different experience than it was in the twentieth century, both in the barrage of commercials, in-house network promotions (often in the middle of innings), and onslaught of statistics that were largely inaccessible a few decades ago. 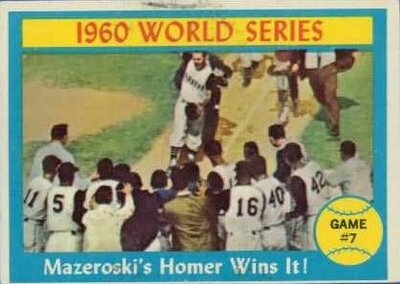 Yet for all that, it’s not at all hard to follow the 1960 World Series game, even if you’re unfamiliar with the teams and players. True, compared to what you see nowadays, the camerawork can seem elementary. There are just a few angles, and no instant replay. 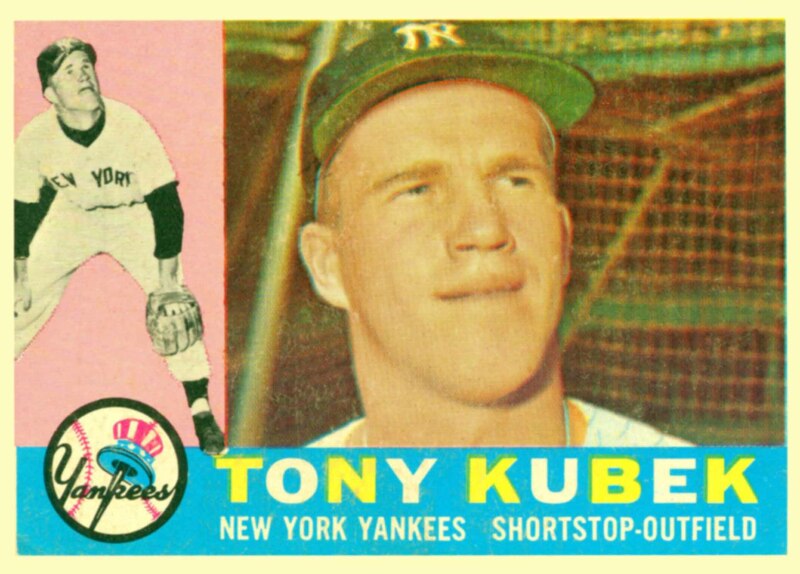 When Yankees shortstop Tony Kubek, for instance, is famously struck in the throat by a bad hop on a grounder that looked like a double play, there are no replays, where today there would likely be a dozen or so. The camera lingers on the scene for literally minutes as Kubek struggles, unsuccessfully, to recover and stay in the game. I’m not one of those purists who laments all the statistics on hand for broadcasters nowadays. I like hearing the OPS, BABIP, left-handed averages, and so forth, as long as it’s integrated smoothly into the flow. I have to say, however, that it’s a little refreshing hearing the announcer (Mel Allen) just stick to the action, and describe it very well. No frills, no bells and whistles, just acute play-by-play description of what’s going on, which in this game seven was very complex indeed, with several tough fielding plays, lead shifts, dramatic home runs, and a really strange play where Mickey Mantle evaded a tag to dive back into first to evade getting erased on a groundball double play that would have ended the game in the top of the ninth. Aside from the relative lack of those interminable delays when batters step out of the box to adjust things, or pitchers taking forever between pitches, it’s very close to the way the game’s still played today. Here are a couple of notable differences, however. One is the lack of African-Americans and Latin-Americans. There are just a couple blacks: Hall of Fame Pirates right fielder Roberto Clemente (from Puerto Rico) and Pirates pinch runner Joe Christopher (from the Virgin Islands). (If you’re wondering about the Yankees’ Elston Howard, the fine African-American catcher did not play that day.) These days just about every club has several Latin Americans on the rosters, and often several from the Dominican Republic alone. A less expected difference was the absolutely atrocious state of the infield dirt. Yes, groundskeeping was less refined back then. But this is a World Series game, and the infield looks like golfers have been chopping out divots for hours the night before. No wonder Kubek got struck by that grounder – which, if not for that bad hop, probably would have been a double play and resulted in a far less dramatic Yankee victory, though of course the Pirates infielders had to contend with the same conditions. Every year, there’s a hailstorm of moans and groans about how baseball’s slipping in popularity, is losing traction with young kids, doesn’t get high World Series ratings, etc. And every year, traditionalists bemoan how the game isn’t what it used to be, that it was better and more meaningful “back then,” whether 1960 or 1990. And really, play the game sevens (both close nail-biters) of 1960 and 2014 back-to-back, and there’s ultimately little difference in their ability to rivet with their suspense. As much as things have changed, that’s remained the same. A 1960 World Series program. In Ken Burn’s history baseball was in the doldrums in the ’70s until the Red Sox and Yankees began appearing in the playoffs. By contrast, I think the A’s, Reds, Orioles, and Pirates teams were the best of the ’70s.